High level officials, including the president, gang up on Church (Update 2) | can i just finish my waffle? Now Rauf is stating that if they MOVE the location of the mosque there will be violence. So no matter what you do or don’t do, there will be violence. Who the hell do they think they’re foolin’? I don’t know what this means, folks. The full power of the federal government against 40 to 50 people?? BOTTOM LINE: Not one single page of one single koran has been burned. NOT ONE. 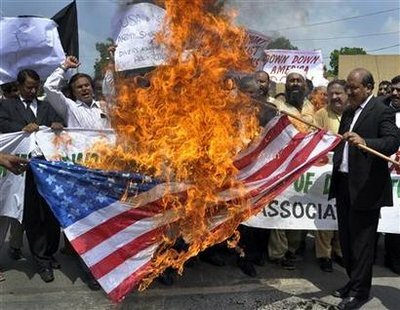 The American flag has been and is being burned. Where is the outrage for this behavior and desecration of our flag? Do we not consider this a provocative act? It is provocative, disrespectful, brash, over-reaction, offensive to me as an American, and what does my country do? Fall over themselves jumping on a silly little man in Florida who hasn’t done anything at all but talk — at least thus far. I hope he does not do any burning, as I have no understanding of why he wants to do such a thing, but how could it be any worse than what these extremists have already done? “”Jordan’s main opposition party, the Islamic Action Front (IAF), on Thursday termed a plan to burn copies of Koran by a US church as a “declaration of War” against Islamic peoples. It’s all so overblown. The media is pathetic for covering a nutcase. Gee, Obama says we all need to remember 9/11 victims tomorrow by using the day to do service? Huh? How does that honor their memories? I heard some of his press conference today where he had a teleprompter! It was literally like Wizard of Oz, someone feeding him answers. I do like the idea of putting a candle in my window tomorrow night in memory of those lost. I will watch the documentary on 9/11 – think they should be showing that to students in High School but they’re busy showing them how to put on condoms. I know Donnie D. is out of it, but has Pat Buchanan lost his effing mind?